[300 Pages Report] The infusion pump market was valued at USD 11.27 Billion in 2017 and is expected to reach USD 15.89 Billion by 2023, at a CAGR of 6.0% during the forecast period. A number of factors such as the increasing incidence of chronic diseases along with the rapid growth in the geriatric population, rising demand for ambulatory infusion pumps, and the growing volume of surgical procedures performed are driving the infusion pumps market. 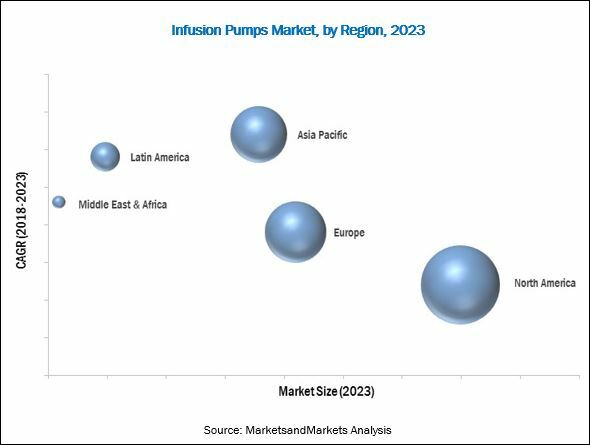 In addition, untapped, emerging markets such as India and China and the growing adoption of specialty infusion pumps are offering significant growth opportunities for players operating in the infusion pumps market. The major players in the infusion pump market are Becton, Dickinson and Company (US), Baxter (US), ICU Medical (US), B. Braun (Germany), Fresenius Kabi (Germany), Medtronic (Ireland), Smiths Medical (US), Terumo Corporation (Japan), Moog (US), Roche Diagnostics (Switzerland), Halyard Health (US), Mindray Medical (China), Micrel Medical (Greece), and Insulet Corporation (US). The global infusion pump market is projected to reach USD 15.89 Billion by 2023 from USD 11.90 Billion in 2018, growing at a CAGR of 6.0%. Factors such as the increasing prevalence of chronic diseases along with the rapid growth in the geriatric population, growing use of ambulatory infusion pumps in home care settings, and growing number of surgical procedures are driving the market growth. The report analyzes the infusion pump market by product, application, end user, and region. On the basis of product, the global infusion pumps market is segmented into devices and accessories/consumables. In 2017, the accessories/consumables segment is expected to grow at a highest CAGR during the forecast period. Growth of this segment can be attributed to the increasing use of accessories/consumables during infusion therapy and increasing prevalence of chronic diseases such as diabetes, cancer. The accessories/consumables segment is further segmented into dedicated accessories/consumables and non-dedicated accessories/consumables. Dedicated accessories/consumables for infusion pumps dominated infusion pump accessories/consumables market in 2017. This can be attributed to the increasing demand for dedicated accessories/consumables in chronic disease management to minimize the risk of non-compatibility of accessories with infusion devices. The devices include volumetric infusion pumps, syringe infusion pumps, insulin infusion pumps, ambulatory infusion pumps, enteral infusion pumps, patient-controlled analgesia infusion pumps, and implantable infusion pumps. In 2017, the insulin infusion pumps segment dominated the infusion pump devices market. The insulin infusion pumps segment is expected to register the highest CAGR during the forecast period. The increasing prevalence of diabetes, coupled with the growing demand for the management of insulin at home, is expected to drive the growth of this market segment. Based on application, the infusion pump market is segmented into chemotherapy/oncology, diabetes, gastroenterology, analgesia/pain management, pediatrics/neonatology, hematology, and other applications. The chemotherapy/oncology segment accounted for the largest share of the global infusion pump market in 2017. 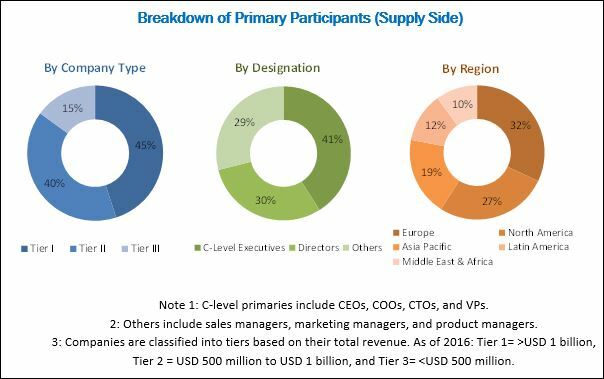 The large share of this segment can be attributed to the growing incidence of cancer, increasing availability of ambulatory infusion pumps for chemotherapy, and the introduction of technologically advanced products in this market segment. The diabetes segment is expected to grow at the highest CAGR during the forecast period. Growth the diabetes segment is mainly driven by the increasing incidence of diabetes and rising demand for insulin pumps for the management of diabetes in home care settings. On the basis of end user, the infusion pumps market is segmented into hospitals, home care settings, ambulatory care settings, and academic & research institutes. The hospitals segment dominated the market in 2017. The large share of this end-user segment is mainly attributed to the strong financial capabilities of hospitals for purchasing high-priced infusion devices, large patient pool, and the availability of trained professionals to operate infusion pumps. Geographically, the infusion pumps market is segmented into North America, Europe, Asia Pacific, Latin America, and the Middle East & Africa. In 2017, North America accounted for the largest share of this market. However, the Asia Pacific region is expected to witness the highest CAGR during the forecast period of 2018 to 2023. Factors such as the rising geriatric population, growing incidence of chronic diseases, increased accessibility to advanced healthcare facilities, rising healthcare spending, rapidly improving health insurance sector, growing demand for advanced technologies, and expansion of private-sector hospitals to rural areas are fueling the demand for infusion devices in the APAC region. However, frequent product recalls of infusion pumps, stringent regulatory requirements for new products, and the increasing adoption of refurbished infusion pumps are restraining the growth of this market to a certain extent. The global infusion pumps market is characterized by a large number of players. The market is highly fragmented and competitive in nature and is dominated by Becton, Dickinson and Company (US), Baxter (US), ICU Medical (US), B. Braun (Germany), Fresenius Kabi (Germany), Medtronic (Ireland), Smiths Medical (US), Terumo Corporation (Japan), Moog (US), Roche Diagnostics (Switzerland), Halyard Health (US), Mindray Medical (China), Micrel Medical (Greece), and Insulet Corporation (US). Key players in the market are pursuing several organic and inorganic growth strategies such as product launches, expansions, acquisitions, and agreements to garner larger shares of the market. During 2015 to January 2018, companies adopted collaborations and agreements as their major growth strategy followed by product launches and enhancements.